A friend leaned over my garden gate and gazed down the garden, then shook his head slightly and said "Oh dear, it's all getting a bit Gertrude Jekyll isn't it..."
Taking my friend's interpretation of a Gertrude Jekyll garden, I can say, with my hand on my heart that I am glad it is 'a bit Gertrude Jekyll', as, if a garden can't be wild, rambling and overflowing in June, then when can it ! 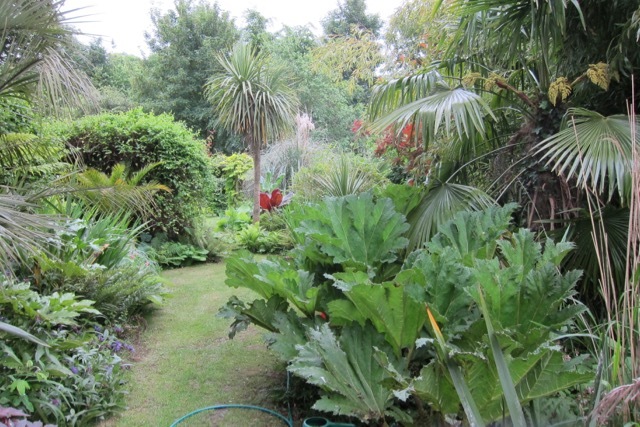 It isn't well manicured, but it does celebrate all the many plants which are accelerating towards their zenith, outgrowing their allotted spaces as they do so. 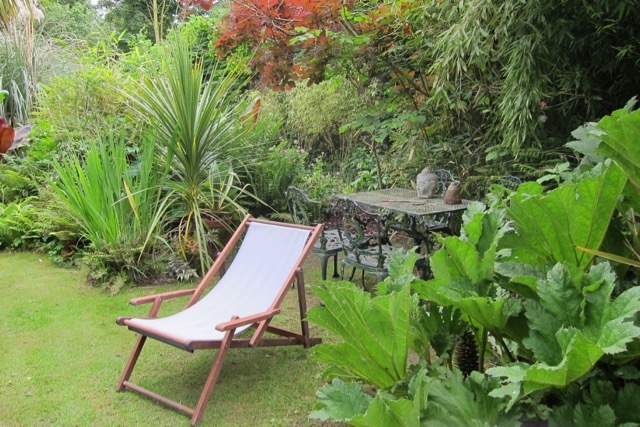 There is so much work to do out there, trying to keep them staked, tied in, cut back, cut down, that I did wonder today if I am a weeny bit crazy, and really I should be lying in a hammock on a square of artificial grass with not a leaf or flower in sight. I could smell the BBQ's firing up in other gardens, and hear people starting to relax and to enjoy the evening, but I just couldn't justify stopping. 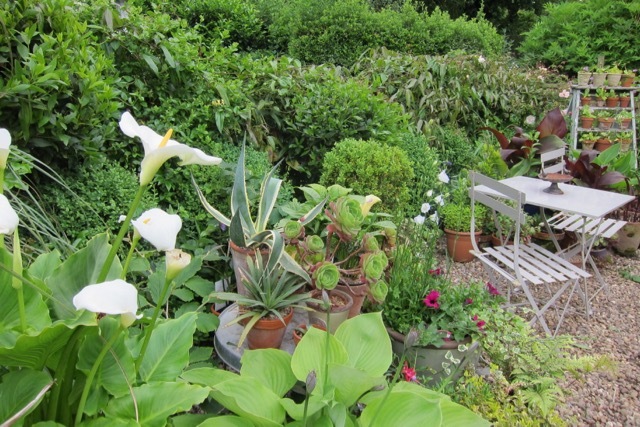 Whilst the process of gardening is infinitely enjoyable and rewarding ... so is just sitting sometimes. So, I have resolved to let it become even more 'Gertrude Jekyll' and take time to smell the roses, as well as weed around them. I will sit on the deck chair which has served only as a resting place for my gardening gloves ! I will take the time to enjoy the days of summer which are slipping by so quickly. We have been busy with new projects, that there has been little time for relaxing. We have developed three new areas in the garden since March, and they have all needed digging, hard landscaping and planting but are now well on the way to completion. The fourth new area is shown below, and still has a long way to go. 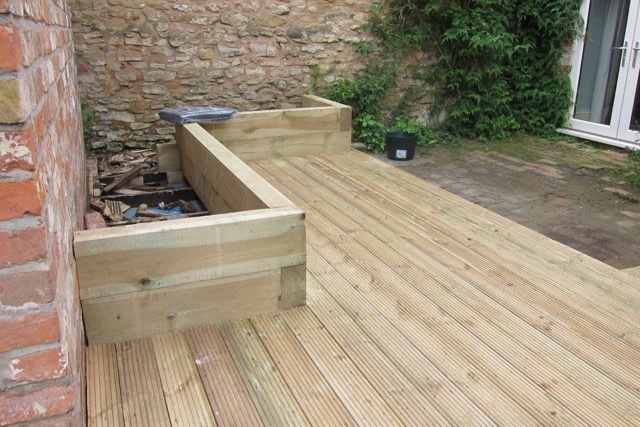 We didn't do the decking ourselves, as we know 'a man who can', but we are beginning work on the raised bed. 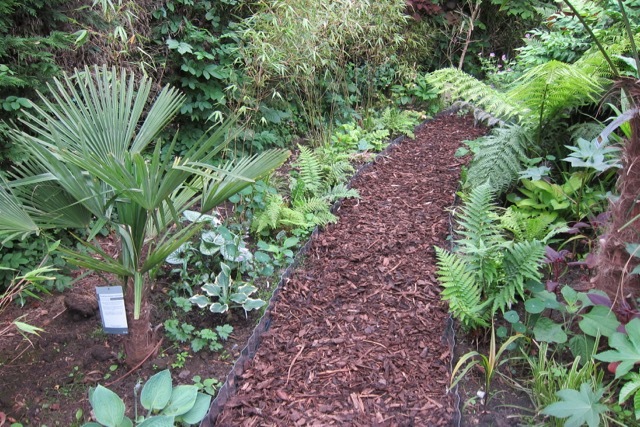 Topsoil is on order, and then we can start planting hostas and ferns, as it is an area of partial shade. The whole bed will be lined with heavy duty plastic sheeting to keep adjoining walls free from damp. I am in the process of selecting a couple of climbers too.The area is very sheltered so I could try something reasonably tender - perhaps a couple of the Abutilons which I bought at Chelsea. Above is one of the new areas we have made this season. It is using land which we have never cultivated in 30 + years, so was very hard to dig initially. 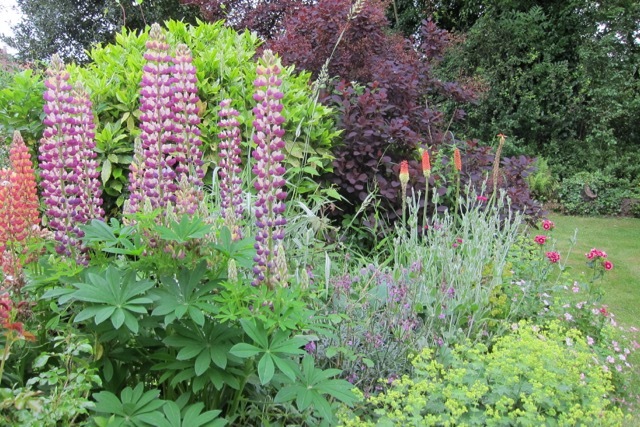 It is an extension of the exotic garden, and very much in its infancy. 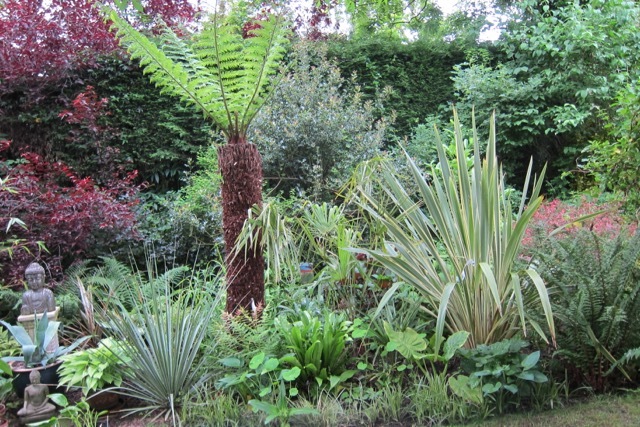 Skeleton planting of palms and small tree ferns has been completed and underplanting, such as hostas and brunnera is in place. 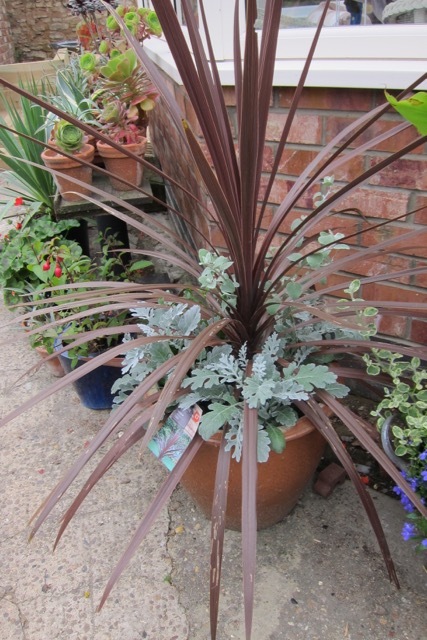 I have grown loads of annuals to fill gaps, and am waiting impatiently for these to get moving. I have grown Amaranthus Caudatus, Amaranthus 'China Town' and Amaranthus 'Velvet Curtain', all for the first time. I will not be growing 'China Town' as you need a magnifying glass to see them, even though I sowed the seed very early! 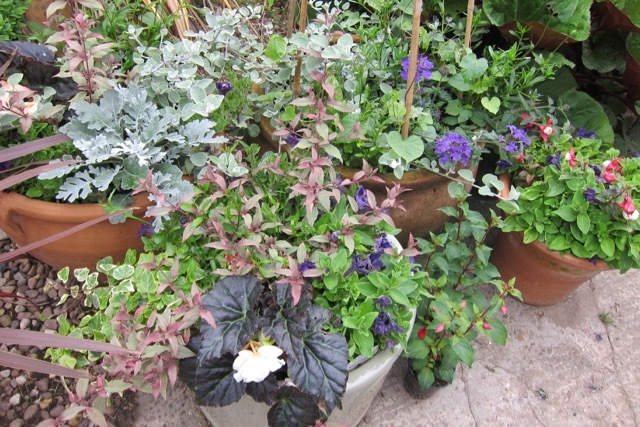 Although you can't see them in the photo there are also Tithonia 'Torch', coleus and zinnias 'Candy Cane. You can just see, bottom right, Ricinus and nasturtiums, starting to put on some growth. 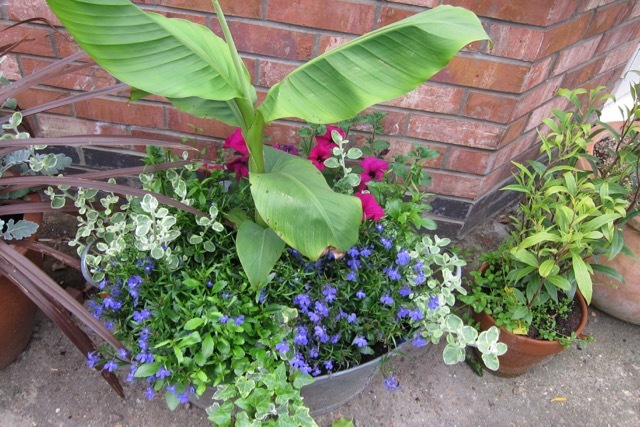 As well as making new areas in the garden, we have been planting up annuals, in pots and tubs. 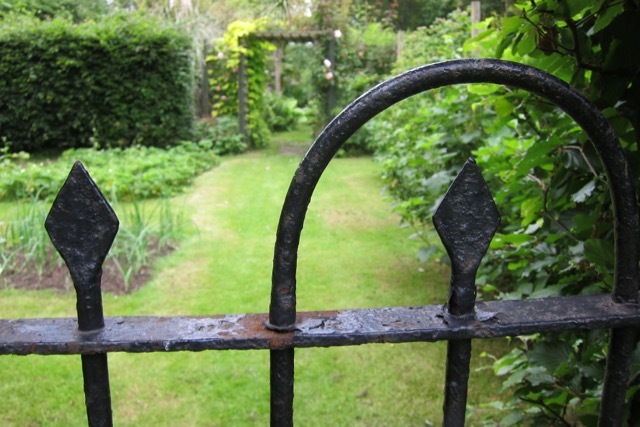 We have also made a purchase from our new, local reclamation yard - a Victorian/ Edwardian garden gate. 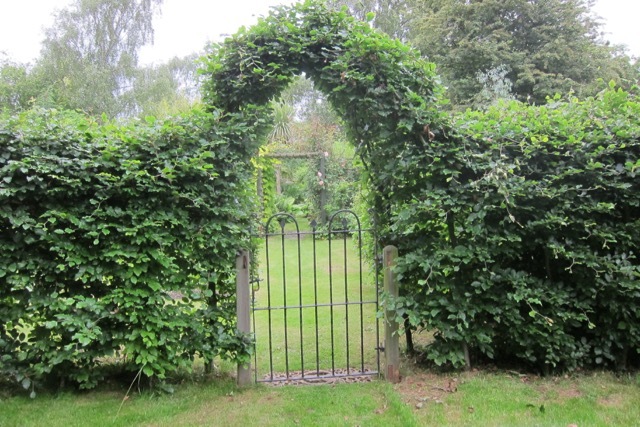 It has seen better days and needs some tlc, but there is something very quintessentially English - garden about it, and I love opening it, and thinking of the other hands, down across the generations, which have done the same. Cost is not important, but it was actually only £30, which is the equivalent of a few basics in the trolley at Tesco, which seems slightly ridiculous, for all that history. Underneath the gate as a sort of ornamental threshold, we have put another piece of salvage. 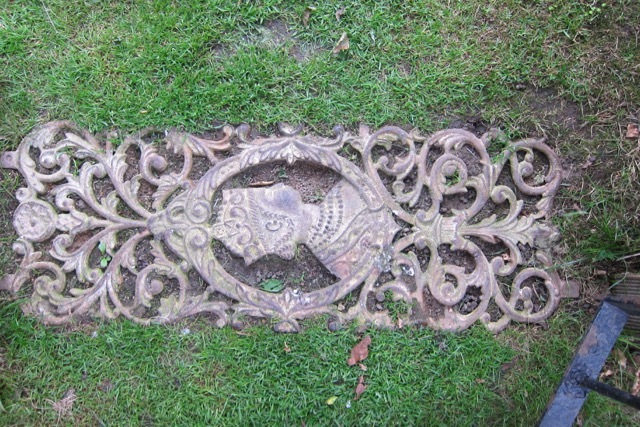 This is a panel from an Indian railing, and shows a depiction of the young Queen Victoria.